Our flower seeded papers include an ample mix of annual and perennial wildflower seeds. Our mixed herb seeded paper includes a mix of Basil, Chive and Parsley seeds. Our seeded paper is able to grow across all growing regions as long as planting directions are followed. Price includes full color cardstock bookmark with die cut seeded paper shape. 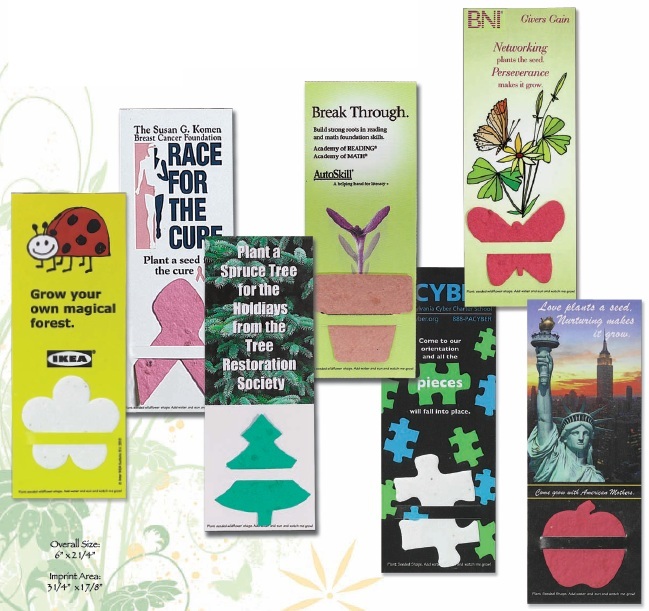 Plant-A-Shape Bookmarks are shipped bulk. Individual sleeves may be ordered for an additional $0.20 each. Price includes full color imprint on vellum paper with seeded paper and planting instructions attached with natural raffia tie. Raffia Tie Bookmarks are shipped bulk. Individual sleeves may be ordered for an additional $0.20 each. 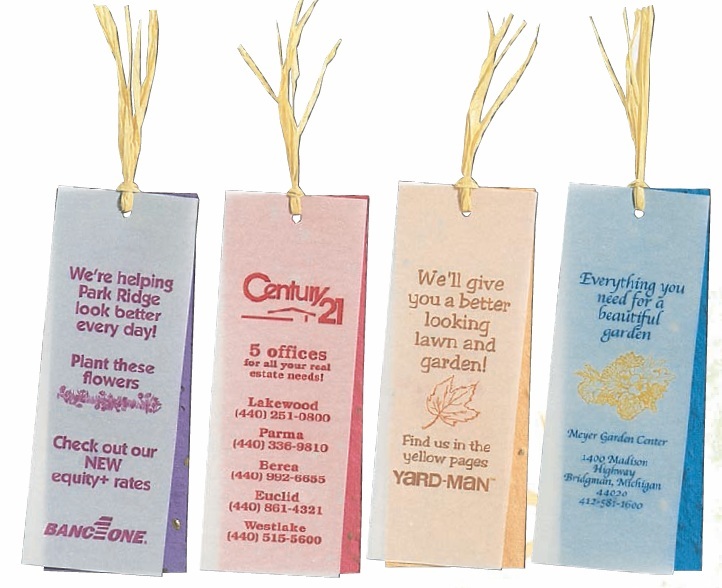 Your full color message is imprinted on a bookmark. Seeds are attached with dissolvable glue to the bottom tear-off section of the bookmark. Remove bottom piece and plant to grow flowers or herbs, and save the bookmark. Choose from a variety of seeds: Marigold, Zinnia, Forget Me Not, Money Plant, Sunflower, Cosmos, Cilantro, Dill, Basil, Chives, Spruce Tree or Wheatgrass. 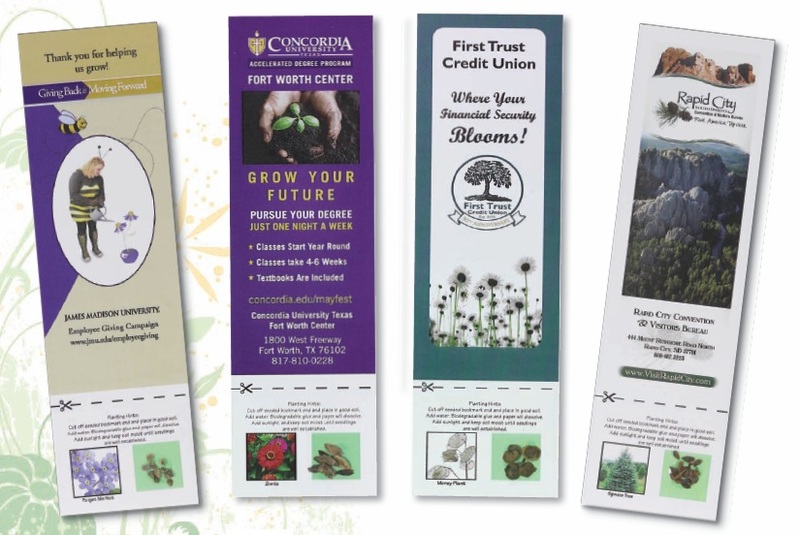 Price includes cardstock bookmark with full color message (printed on one side) and your choice of seeds. 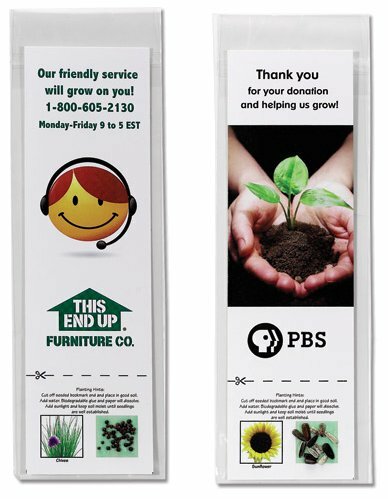 Bookmark with Seeds are shipped with individual sleeve.